Amid the public protests that marked the G20 Summit in Hamburg, Germany from July 7-8, 2017, a Joint Declaration was released. The G19 leaders showed solidarity and reinforced their commitment to Paris Agreement, stating that it was ‘irreversible’. Public protests were largely directed at Trump’s pulling out of Paris Agreement and the fact that rich countries are predominantly responsible for climate change. 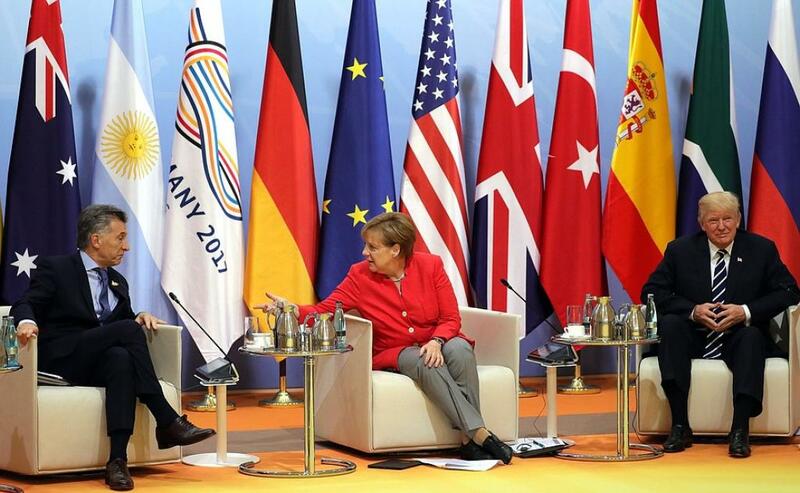 German Chancellor Angela Merkel, hosting the G-20 Summit, said she “deplored” the US decision to withdraw from the Paris climate deal. The issue of climate change also proved a bottleneck in the drafting of the final joint declaration where Trump insisted on the inclusion of US stance on climate change and a paragraph on fossil fuels on which other countries had reservations. Countries finally conceded to US’ demands and one of the sections in the final text reads: "the United States of America states it will endeavour to work closely with other countries to help them access and use fossil fuels more cleanly and efficiently and help deploy renewable and other clean energy sources”. Other than the US' climate stance, no other country-specific statement or stance is mentioned in the joint statement. Even though countries such as India may not have any reservation on US’ stance on fossil fuels as coal and other fossil fuels will continue to be a part of its energy mix for some more years to come, European economies and activists seemed to be less approving of US’ insistence on fossil fuels. During the Summit, British Prime Minister Theresa May and French president Emmanuel Macron, in their bilateral meetings with US President Donald Trump, urged him to consider re-joining the Paris Agreement, which, under the current US climate stance, seems like a distant possibility. Trump’s focus in the Summit, on the other hand, was primarily on trade and he spoke of finalising trade deal with UK “very soon” and confirmed his visit to London in this regard. The Joint Declaration reiterates the need to help developing countries with means of implementation in their mitigation and adaptation efforts. An OECD report titled “Investing in Climate, Investing in Growth” is also taken note of. It underscores the economic opportunity to invest in right infrastructure in the current circumstances ‘to reignite growth while also paving the way to achieving the Paris Agreement goals’. Countries have also committed to US$ 100 billion by 2020 for the Green Climate Fund to help most vulnerable countries in addressing climate change'. Countries, excluding the US, have also endorsed the G20 Action Plan on Climate and Energy for growth to build resilience, improve sustainability and provide enabling environments in line with keeping the goals of restricting global warming to well below 2 degree C as mentioned in the Paris Agreement. One of the highlights of the Action Plan is the commitment to global energy transition by 2050 which must lead to net zero GHG emissions in the energy sector. It also talks of developing long-term, low greenhouse gas development strategies (LTS) that would also help in mainstreaming national climate policies and their submission by 2020. The document is the first of its kind emerging out of G-20 meet, detailing on next steps on implementation of Paris Agreement. In the summit, a range of issues related to trade, investment, climate and energy, global financial architecture, health systems, sustainability and women empowerment were discussed among others. With regards to trade and investment, countries vowed to fight protectionism, including all unfair trade practices and recognise the role of legitimate trade defence instruments in this regard.